Plastic Strap Guards, Plastic Edge Protectors,plastic cornerboards, Riverside Paper Co. Protect your loads from damage caused by tight strapping. Plastic edge guards are for use with steel or poly strapping. The Ribbed channel on the Plastic edge protectors prevent your strapping from moving. 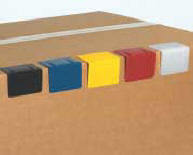 1-7/8x1" Guards protect shipments from damage caused by tight strapping. 2-1/2x1-3/4" Guards protect shipments from damage caused by tight strapping. 2 -1/2 x 1- 3/4"
2-1/2x2" Guards protect shipments from damage caused by tight strapping. Plastic Strap Guards,plastic edge guards, plastic edge protectors, plastic corner protectors,Correa de plastico Guardias, guardias de borde de plástico, protectores de bordes de plástico, protectores de esquinas de plástico.